Construction 1 : To construct the bisector of a given angle. Given an angle ABC, we want to construct its bisector. 1. Taking B as centre and any radius, draw an arc to intersect the rays BA and BC, say at E and D respectively [see Fig. i]. 2. Next, taking D and E as centres and with the radius more than 1 2 DE, draw arcs to intersect each other, say at F.
3. Draw the ray BF [see Fig. ii]. 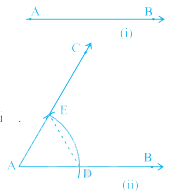 This ray BF is the required bisector of the angle ABC. Let us see how this method gives us the required angle bisector. Given a line segment AB, we want to construct its perpendicular bisector. 1. Taking A and B as centres and radius more than 1 2 AB, draw arcs on both sides of the line segment AB (to intersect each other). 2. Let these arcs intersect each other at P and Q. Join PQ (see Fig.). 3. 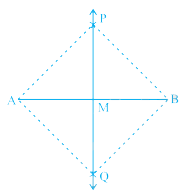 Let PQ intersect AB at the point M. Then line PMQ is the required perpendicular bisector of AB. Let us see how this method gives us the perpendicular bisector of AB. Join A and B to both P and Q to form AP, AQ, BP and BQ. As ∠ PMA + ∠ PMB =180° (Linear pair axiom), we get ∠ PMA = ∠ PMB = 90°. Therefore, PM, that is, PMQ is the perpendicular bisector of AB. Construction 3 : To construct an angle of 600 at the initial point of a given ray. Let us take a ray AB with initial point A [see Fig.]. We want to construct a ray AC such that ∠ CAB = 60°. One way of doing so is given below. 1. Taking A as centre and some radius, draw an arc of a circle, which intersects AB, say at a point D.
2. Taking D as centre and with the same radius as before, draw an arc intersecting the previously drawn arc, say at a point E.
3. Draw the ray AC passing through E [see Fig.]. Then ∠ CAB is the required angle of 60°. Now, let us see how this method gives us the required angle of 60°. Therefore, Δ EAD is an equilateral triangle and the ∠ EAD, which is the same as ∠ CAB is equal to 60°.